Miami Mozarteum's programs provide fascinating and entertaining evenings of music. These concerts feature the most well-loved masterworks of Mozart; his greatest symphonies, most exciting overtures, virtuoso concertos. Evenings of music not to be missed! Mozart's family was centered around music. Father Leopold (1719-1787), sister Nannerl (1751-1829), and son Franz Xaver (1791-1844) were all accomplished musicians. Did Mozart's musical genius descend from and transfer through the generations? Find out in opening this fascinating family album! 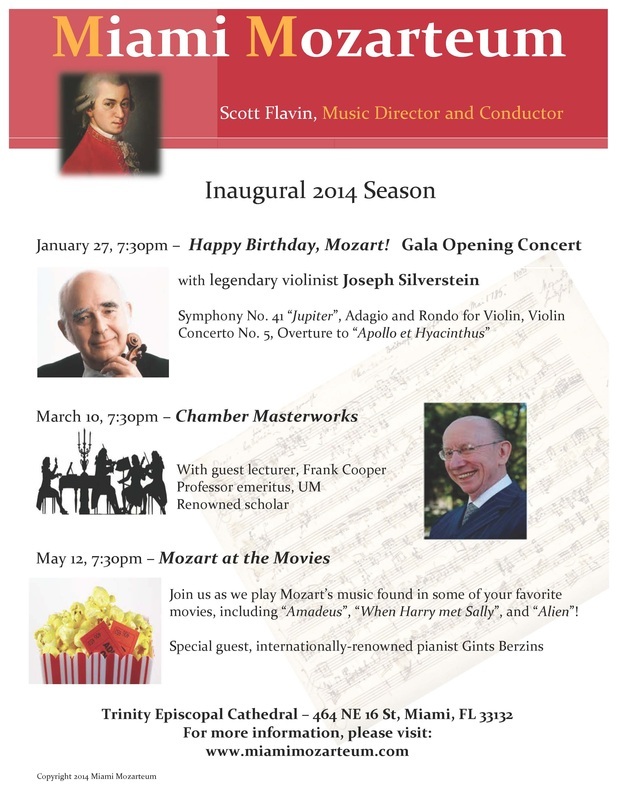 This concert features all music of the Mozart family. Through Mozart's correspondence with his father, wife, family, and friends, we get a rich portrait of one of the greatest composers, along with musical excerpts that highlight this look at Mozart the man. This wonderful program explores the music that influenced Mozart, as well as later works influenced by him, from his death to the 21st century. Includes works of Bach, Handel, Beethoven, and contemporary master composer Schnittke. In addition to 1985's infamous "Amadeus", Mozart's works have lived on in many motion pictures, including "Elvira Madigan", "Out of Africa", and "The Spy Who Loved Me", among others.